Leave no stone unturned on this journey through Ireland. Start your guided tour in Limerick, head to the breathtaking Cliffs of Moher, and visit Rathbaun Farm, where you’ll see a farmer shear a sheep and use a sheep dog to maneuver his flock. Stop at the fishing village of Clifden, visit Kylemore Abbey, the pilgrimage site of Knock, Belleek, famous for its exquisite Parian china, and awe-inspiring Giant’s Causeway. Learn about life in Northern Ireland from your Local Guide in Derry and spend two nights in Belfast, where you are taken on a Living History tour before you explore the fascinating Titanic Exhibition. A Local Favorite on this tour is an evening excursion to the nearby seaside town of Donaghadee for dinner at an award-winning, family-run local pub. In the Fair City of Dublin, enjoy an orientation drive that includes O’Connell Street, St. Patrick’s Cathedral, and a visit to Trinity College with its Book of Kells. Travel south through the Wicklow Mountains, pausing at Ballyknocken House for an entertaining baking demonstration, coffee, and scones. Next up: Kilkenny, the House of Waterford Crystal, Blarney Castle and its magical Kissing Stone, Cork, and the lush, tropical garden on Garinish Island. Spend two nights in the popular resort town of Killarney with an excursion to the Blasket Islands Centre on Dingle Peninsula. Your marvelous guided tour ends back in Limerick. Day 1 Arrive In Shannon, Ireland – Limerick. 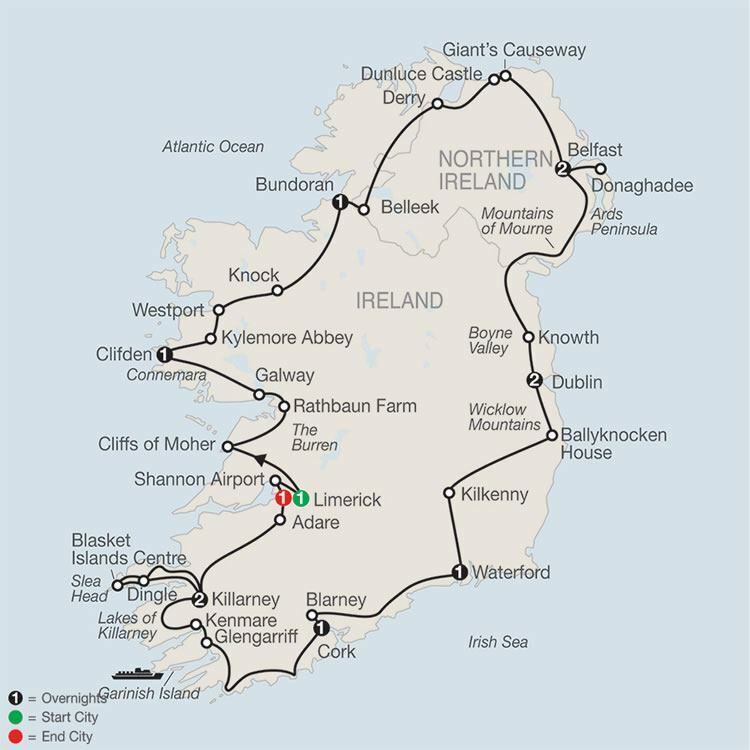 Day 2 Limerick – Cliffs Of Moher – Galway – Clifden. Day 3 Clifden – Kylemore – Westport – Knock – Bundoran. 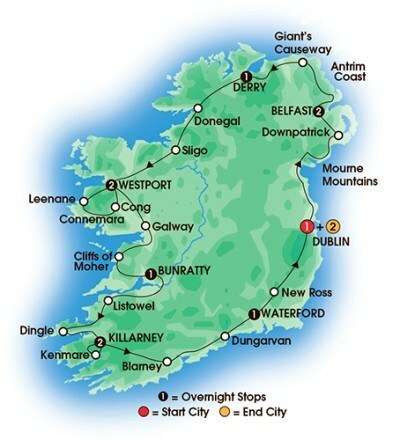 Day 4 Bundoran – Belleek, Northern Ireland – Derry – Giant’s Causeway – Belfast. Day 6 Belfast – Knowth, Ireland – Dublin. Day 8 Dublin – Kilkenny – Waterford. Day 9 Waterford – Blarney – Cork. Day 10 Cork – Garinish Island – Killarney. Day 11 Killarney. Dingle Excursion. Day 12 Killarney – Adare – Limerick. CLIFFS OF MOHER: Savour the spectacular views. RATHBAUN FARM: See the farmer at work and enjoy morning coffee in the farmhouse. CONNEMARA: Visit a marble workshop. KYLEMORE: Visit the Benedictine abbey. WESTPORT: Visit this heritage town. KNOCK: Visit the religious site. BELLEEK: Guided tour of the pottery factory. COUNTY ANTRIM: Take pictures of Dunluce Castle, visit Giant’s Causeway. BELFAST: Guided “Living History” tour, visit the Titanic Exhibition. DONAGHADEE: Early evening drive to the Ards Peninsula and dinner at Pier 36. BOYNE VALLEY: Guided tour of the Bronze Age passage-grave at Knowth. BALLYKNOCKEN HOUSE: Baking demonstration and morning coffee and scones. KILKENNY: Explore this pretty county town. WATERFORD: Enjoy an Irish Coffee demonstration; guided tour of the House of Waterford Crystal; guided walking tour. BLARNEY: Visit the famous castle and kiss the Blarney Stone. GLENGARRIFF: Private boat to Garinish Island. RING OF KERRY: Take pictures of the Lakes of Killarney. DINGLE PENINSULA: Visit the Blasket Islands Centre and the town of Dingle. ADARE: Admire the thatched cottages. MEALS: Full Irish breakfast (B); 5 three-course dinners with wine (D) and choice of menus, including a welcome dinner in Limerick, and 1 dinner at a family-run pub in Donaghadee. TRANSPORTATION: Motorcoach; private boat to Garinish Island. MyACCOUNT Personalize your tour ahead of time with additional excursions. Visit our website for details and conditions. Full Irish breakfast (B); 5 three-course dinners with wine (D) and choice of menus, including a welcome dinner in Limerick, and 1 dinner at a family-run pub in Donaghadee.